Our 2015 goal was to Finish The Rapidan! In 2013, Sweepers completed 20 miles in the middle section of the river near the Town of Orange. In 2014, another 20 miles of the Rapidan was completed along with 20 miles of the Robinson River (a tributary of the Rapidan). The work of the previous two summers left us in a great place to complete the Rapidan. We knew there would be some challenges that we hadn’t previously encountered. We would have to work our way back from the program’s original starting point in 2013 at Liberty Mills in Somerset, VA, to the shallow head waters beyond Graves Mill at Shenandoah National Park – roughly 20 miles of river. We would then pick-up where we left off last year just past Woodberry Forest School and head down to the confluence with the Rappahannock River in Spotsylvania County – roughly another 20 miles of river. The upper reaches were navigable only on foot. The lower portion of the river widens greatly as it passes Eley’s Ford and heads towards the Rappahannock. In this section, due to its width, more boats and Sweepers per river mile were needed to span the width of the river. StreamSweeper donors, after learning of our need for more boats to cover the lower section, provided thousands of dollars as well as used boats to expand our fleet. Building on relationships created over the last two summers, StreamSweepers was able to coordinate access in these two distant sections of the river and to secure the financial resources and commitments from key contributors and long-time Supporters and Program Founders. As last year, we were fortunate to have on staff a third-year program participant working as a “River Analyst” to compile and review the assessment data we collected and compare it with 6 the Rapidan River Riparian Assessment study completed by the Virginia Institute of Marine Science (VIMS) and Friends of the Rappahannock (FOR) in 2000. Based on findings in previous years, we decided to add the identification of invasive species to the Sweeper training education. 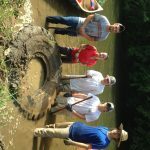 The Macroinvertebrate assessment detailed in this report was completed by Senior Sweeper, Cole Reeves. Most of the watershed analyses work was completed by the Analyst, Griffin Rice, with technical oversight by Center for Natural Capital Executive Director, Michael Collins. Sweepers continued water quality testing throughout the remainder of the Rapidan. In Partnership with the National Institute of Health, National Cancer Institute, a new sampling protocol was created for screening of endocrine mimicking compounds. We have received preliminary testing results which will be reviewed and findings will be distributed at a later date once analysis is complete.